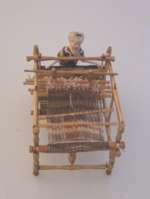 Parian doll weaving on Ground Loop. 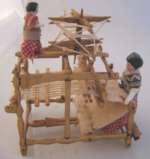 2 dollhouse dolls with loop and spinning wheel. 46 cm / 18"Danish doll marked ChK. Made of caramic material, composition ca 1830-40. Moldedhaii, iset glasseyes,. Antiqe original dress. 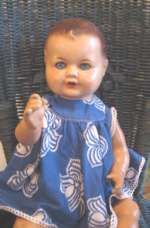 Lovely doll with a lot of childhood memories.. Excellent condition. Original dress, treat condition. ORMOLU WAX JACK Erhard and Söhne. 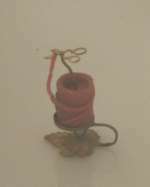 1 3/4" high is this rare WAX JACK from Erhard & Söhne.Beautiful and unusual Ormoluholder with a base in a form of a leaf, a holder and a pair of scissors (working) at the top to cut the wax for the Karosene lamps in the dollhouse..A rare piece for the dollhouse. Ca 1850. Fine all original condition.Germany. 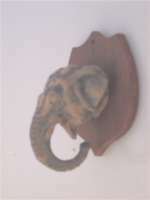 2 1/4" /5,7 cm High old Hunters Trophaee of an Elephant head.The head is made of composition/wood on a wooden plate to hang on the dollhouse wall.A fine item in the Gentlemans room or the libary. (Memory of the hunters big game Safari) German, 19th century. The condition is good, but with some wear to the surface. 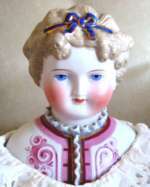 21"(53 cm) Wonderful decorated young girl.This is a very delicate parian doll with extremely fine and heavy molded blouse in pink floral design with fine ribbon collar and decor in excellent condition..The blue and gold ribbon in her hair add the extra touch to this young beauty .Lovely molded hair with visible brushstrokes. Cafe au lait hair color. Muslin body and china limbs. Antique dressed in white to keep her gentle girlish expression. Ca 1875.